No matter how much one dives into the lore of The Legend Of Zelda Majora’s Mask, establishing absolutes about what really happened in the world of the 18-year-old Nintendo 64 adventure can be tricky. I’ve decided to try. The Zelda games usually follow the Triforce mythology in which reincarnations of Princess Zelda and the adventurer Link battle the villainous Ganondorf. Majora’s Mask disconnects itself from all of this and takes us on a journey into the macabre. Its story and the game overall feel like they come from a twisted parallel universe. I’m far from the first person to try to make sense of what happens in the world of Majora’s Mask, to try to understand the origins of its world and the motivation of its wide range of characters. The game begs for this kind of exploration. Much of its story is told in vague myth, allusion and iconography. In-depth studies such as Dan Merrill’s “The Message of Majora’s Mask”and Zelda Universe’s analysis of the Stone Temple ruins have scrutinized minute design details to understand their implications to the wider storyline, but the game’s lore remains mysterious. When I first played through Majora’s Mask, I was taken aback. Nintendo had taken the vibrant components of its predecessor, the seminal Ocarina of Time, and assembled them in a way that made no sense. As I explored its world, everything felt unnerving. Where Ocarina was driven by hope and heroism, Majora’s Mask was a descent into despair and doom. I was astounded to find the game design centered on a single rigid rule: the world would always end within three days. As I delved deeper into the adventure, what startled me above all else was the nature of the antagonist. Ganondorf was not plotting beyond the horizon, and Agahnim and the rest of the rogues gallery were nowhere to be seen. Instead, our adversary was a strange, haunted child—one somehow attuned to an entity of otherworldly malevolence. The crux of the story is the tale of these two villains: the cosmic being known as Majora, and the immortal cherub referred to as The Imp. Everything that happens is about their partnership and ultimately their conflict. This is, I believe, the true story of the game, and so I have taken the time to tell its story in as great detail as I can for your consideration. You’ll see that version of events below, with a mix of quotes, action and imagery. The quotes I use were all spoken by characters from the Zelda games. In stitching together a narrative, I’ve noted who said these things and in which games. To illustrate this exploration, a number of extremely talented artists have kindly given permission for their pieces to be exhibited. I am very thankful for their generosity and encourage you to view their portfolios to see fuller versions of the images, and their further works. Note: In my interpretation, I’ve connected Majora’s Mask to elements from other Zelda games. Other games in the series refer to a pantheon of deities and demons with which I seek to contextualise Majora’s Mask. I’ve not based my take on Majora’s Mask from elements in the official Zelda resource book Hyrule Historia. For all that book’s intrigue, it makes several contradictory changes to the lore a decade after the fact, including the idea that events from the game were generated from the mind of Skull Kid, rather than having a tangible history in their own right. Comics and Manga are also excluded as non-canonical. I want to interpret the story based on the games. The multiverse was once a maelstrom of disorder. The energies coalesced, forming the gods, the most bold of whom were the three sister deities: Din, Nayru and Farore–the Golden Goddesses. They created the world of Hyrule and seeded it with life, before leaving it in the care of the lower deity Hylia. Other worlds were later birthed, such as Termina, Holodrum and Labrynna. As the young races progressed into the earliest civilisations, they became aware of a mighty war playing out across the cosmos. There had been a schism in the cosmic plane, and number of great deities had become corrupted by their own power. They embraced their status as demons: Demise, Malladus and Majora. The battles of good versus evil were a fury of magics, powerful enough to sometimes breach the material world. Monsters spawned, slaughtering their way through the terrified mortal kingdoms. In the realm of Termina, a disturbed cult came into existence. While the surrounding civilisations feared the onslaught of the monstrous hordes, the cult revelled in the chaos. They saw the violence as divine, and began to worship their chosen icon: Majora. The cult revered the demon Majora as a consumer of people’s suffering, and sought to feed its endless appetite for misery. They fashioned a sinister mask in the image of their master and used the artifact as the centerpiece in a succession of bloody sacrifices. Abducted victims were forced to don the mask and suffer. The cult believed that, through the mask, the suffering would be channelled directly into their demon god. Majora became aware of this theater of violence, and while the concept of worship was incomprehensible to the great cosmic entity, the atrocities fed into its eternal hunger. Over time, intense frustration formed in the demon. As an immaterial being, Majora was disconnected from the visceral. The deity lusted to experience violence directly and became increasingly distracted from the celestial war. The entity wanted to experience, even briefly, the realm of mortals. Unable to control its desires, Majora projected its awareness and a portion of its power into the ritual mask. The reward was immediate and overwhelming, an ecstasy of intimate violence of which it had never known. As the demon regained its senses, it experienced horrifying realization: it could not withdraw from the mask. Majora had become disconnected from its body of power, its great cosmic bulk now floating inert throughout the multiverse, detached from its mind. Its cosmic adversaries had been patient, and at the most timely moment, had sealed off Majora’s route of return. With Majora cut off from the celestial conflict, the balance of power monumentally shifted. The forces of good were able to overwhelm the remaining great demons—Demise and Malladus—and soon all the demonic kin were sealed away. Majora’s mistake had lost them the war. The beast had fury beyond measure and tried to lash out, but nothing happened: Majora’s mind was now bound to an inanimate wooden vessel, from which it could do little to influence its environment. As the mask was used in further rituals, Majora tried to connect to each wearer, but it didn’t work. The demon could not make a bond unless a vessel was willing. Even Majora’s own worshippers unconsciously felt unworthy of such an honor, and unintentionally resisted the deity’s influence. Majora was able to gather much suffering into itself, but remained powerless. The cosmic god had been lured into the material world by barbarism and was now trapped by its own short-sightedness. In this dark era of Termina’s history, a mysterious figure emerged from across the dimensions. He was an Agent of the Cosmos, a servant of order, whose mission was to gather and contain dangerous artifacts to prevent their misuse. He discretely took up the mask of Majora and placed it into his collection. Unseen, the strange man then departed for the stars. The cult never knew who had taken their most valued treasure. Over the centuries, the cult expanded into a mighty warrior civilization known as the Kingdom of Ikana. The history of Majora’s Mask fell into myth and became worshipped by the kingdom only in abstract, with a great stone tower built to revere the icon—though the true meaning behind the image of the mask was no longer understood. The kingdom was mighty and conquered many lands, but a great corruption began to take hold. The subjects of the kingdom ceased to die, continuing to exist in a decayed, undead form. Within decades, their entire civilisation was reduced to a host of animated skeletal beasts, only dimly aware of their glorious history. They stood guard at their ancient borders, never venturing beyond the limits of their cursed land. The forebears of Ikana had dabbled with dangerous energies when they had first summoned Majora. The magical taint had been passed on throughout the generations, and had finally emerged to consign the kingdom to millennia of purgatory. As Ikana fell into shadow, the rest of Termina ascended. It became a serene world in which several sentient races coexisted in peace. The great tribes and their four kingdoms–the humans, the mountain Gorons, the aquatic Zoras and the forest-dwelling Deku–all lived in awe of a quartet of benevolent Giants that guarded them from harm. Together, they had tranquil and fulfilling lives. One day, a strange little creature appeared. It was seemingly a young boy, but not of a kind ever seen in the world of Termina. The child– known as The Imp – quickly befriended the Giants. The titanic guardians pondered the mystery of The Imp’s origins. Some suggested the boy had been deposited from another dimension, while others proposed that he had been born out of magic. The Imp needed a family, and the Giants were happy to take the responsibility. They raised The Imp, giving him a glorious childhood. As the decades passed, the Giants came to realize that The Imp was not growing to maturity. He would remain a child, seemingly forever. He would never grow up. This was the curse of The Imp. As time went on, their games with The Imp grew slower, more difficult. The Giants were getting older and were more easily exhausted. They tried to explain this to The Imp to gain his understanding and patience, but the child did not comprehend. He became bitter. Selfish. Angry. He was hungry for attention and began to tease and torment the civilizations of Termina. The tribes turned to the Giants to control their adopted son. The aging Giants were now barely able to stay awake. They needed a prolonged period of rest, centuries of slumber to reinvigorate themselves. The four were concerned that, without their control, The Imp would torment the people of Termina. Seeing no other choice and with great sorrow, the Giants combined their powers to open a dimensional aperture. They cast the boy to a nearby universe–Hyrule–which they believed was watched over by the goddesses of light. They hoped that in their wisdom, Din, Nayru and Farore could satiate The Imp’s endless need for attention. When it was over, the Giants shared a crushing epiphany. They now realized the curse of The Imp. He was born to be a child forever and could never have parents capable of keeping up with him. They again considered the boy’s origins. He had likely been cast out before, from dimension after dimension, as each adoptive family grew too old and weak to manage his unruly behavior. The child had been abandoned and abandoned, and this cycle would never, ever stop. The Giants slumbered, and as the four rested, the denizens of Termina built shrines to their grace. Each shrine was decorated with cultural and religious iconography. Some of their prophets insisted on the inclusion of a strange mask-shape–one that already adorned the Ikana ruins—for they foresaw it as being of great significance in the events to come. The Imp was alone once more, exiled to a strange and uncaring world. He was overwhelmed by a deep and inconsolable sadness. At the moment of his exile, the Giants had told him that three goddesses held sway over this place. The Imp quickly learned that these deities—Din, Nayru and Farore—had in fact abandoned this dimension long ago, leaving the realm dominated by the crude savagery of the lesser races. There was darkness and distrust in Hyrule, as monarchs warred over an ancient artifact called the Triforce. The Imp had no interest in such matters. He wanted to be alone. He retreated into a plateau of dark woods, and embraced his despair. Centuries of misery passed. Woodland explorers sometimes caught sight of The Imp, and not understanding the nature of the elusive creature, dubbed him “Skull Kid” due to his unsettling appearance. On a day like any other, The Imp felt something else: the presence of someone suffering as much as he. He felt kinship with this entity, and wished to share their miseries. The Agent of the Cosmos, with his collection of dangerous cosmic artfiacts, was in Hyrule. He had adopted the persona of the Happy Mask Salesman, presenting as an eccentric businessman who simply wished to traverse the lands without incident. During a routine journey near the dark woods, the Happy Mask Salesman was suddenly attacked by The Imp. The child tore his way through the artifact cache. The Agent pleaded, as The Imp finally came upon the Mask of Majora. This mask, The Imp knew, was the source of the suffering he had sensed earlier. Their suffering had resonated and united them. The Imp vanished into the woods, and with great excitement, put on the mask. He offered himself as a willing vessel. The world shook. The Imp became connected with the reservoir of cosmic power within the mask. The raw energies of the primal universe flowed through his small body. The Imp could sense worlds beyond worlds, the multiverse of realities, and the great entities that existed above them all. He could see planets as playthings and realized he could transform people and places with ease. But there was something else: a dulled consciousness within the mask, its awareness atrophied from millennia of imprisonment. It suffered, but it also hungered for suffering in others, for an endless feast of miseries. The Imp now shared this sinister hunger. The two entities settled into their new, conjoined existence. The power of Majora offered The Imp anything that he desired. With a simple thought, the two opened a dimensional gateway to return to the land of the Giants. Upon his return to Termina, The Imp used his new power to gather matter and mass and created four monstrous lieutenants. He dispatched each to desecrate the temples of the sleeping Giants, to ensure that no one would wake them. His bitterness at their betrayal had been amplified by the power of the mask. The Imp then began to play his games with the people of the world. He saw his tricks as teases and taunts, not comprehending the tortures being unleashed. He corrupted the land, poisoned the rivers, and altered the weather into a dangerous tempest of fire and ice. He raised the dead and commanded them into the night, tasked to slaughter those who dared to brave the darkness. Suffering began to gather. The Imp became more cruel. He framed a boy for a crime he didn’t commit, forcing his own people to send him to his execution. He cursed a widower with an undead pox, sealing him in a wardrobe to scream forever at his terrified son. He tracked down two lovers on the eve of their marriage, and transformed the groom into a child, destroying any chance of the ceremony taking place. The Imp stole. He burned. He destroyed. He sowed more and more suffering. Yet, this still wasn’t enough. The Imp broadcast an invitation across the stars, goading predatory species to come to Termina, to frighten its people and ransack its resources. A cabal of alien invaders arrived to steal crops and cattle, stalling agriculture and starving the denizens of the realm. A number of residents were snatched in the night, to face unknown horrors in their starships. And yet even then, this was not enough. The Imp hungered for intense quantities of suffering. The consciousness of Majora was emerging, overwriting The Imp’s persona with each passing day. Its hunger for misery became paramount. The two looked into the stars and saw the moon. And together, they had the most abhorrent idea. With a single raised hand, The Imp and Majora pierced reality. They conjured a storm of ferocious black magic, and directed the chaos towards the lunar mass above. They willed its matter to change, and in a fiery transformation the cratered surface became a colossal tortured grimace. The moon opened enormous eyes, each glowing with the toxic magic of Majora. The demon and The Imp commanded the mutilated moon to change its trajectory. They directed it to crash into the planet in a few days. In less than a week, there would be an event unlike any other: A cacophony of chaos, a symphony of suffering, and at the height of fear, the catastrophic mass-murder of a world. The Imp–fully corrupted by the mask’s demonic influence–looked forward to the show. Within the mask, Majora kept its intentions private from The Imp. The demon had plotted for years what it would do with a willing host, and so far, everything was going to plan. It would consume everything. The murder of a world would create a maelstrom of suffering which Majora would be able to harness. The enormous infusion in power would be enough to reconnect the trapped consciousness within the mask with its vacant cosmic body, finally returning the entity to godhood. Suddenly, both Majora and The Imp sensed something: a power that could contest their supremacy. There was an artifact somewhere just outside the edges of the dimension, an item that contained immense magic. They didn’t understand what this signified, but knew they could take no chances. They propelled themselves through a dimensional aperture. The Hero of Time, the Kokiri known as Link, was exploring a forest at one of the distant borders of Hyrule. He searched for his long-lost friend, the fairy Navi, who had vanished at the end of their last adventure together. On his person was the Ocarina of Time, a legendary Hyrule artifact that gave its wielder the power to manipulate time itself. Princess Zelda had vaguely foreseen a situation where the Ocarina would be of use to Link, and had insisted he took it with him. A figure leapt from the darkness, knocking the hero from his horse. Link recognized the being as the Skull Kid of Kokiri legend, but clad in a strange and sinister mask. The Imp snatched the Ocarina and Link’s steed and galloped into the distance, all the while trying to figure out how to access its power. He heard Link following. Turning his attention away from the Ocarina, The Imp recognized an opportunity to cause more suffering. It lured Link across a dimensional conduit, disorienting the Kokiri adventurer. The Imp used the power of Majora to transform the Hero of Time into a less potent form. Link screamed as his flesh twisted around his bones. The agonies of transformation faded and Link regained his awareness. His fingers didn’t move as they should, and his legs felt stiff. His head felt heavier and it was difficult to breathe. It took a few moments, but the hero realized what he had become: a Deku Scrub, a biped wooden plant creature. The Imp retreated, and while Link chased, he struggled to keep up. His transformed body was less athletic. In the confusion Link got lost in the dimensional conduit. He emerged far from the Imp. It was dark, and there was the smell of dirt and oil. A great wheel spun somewhere, driven by water from an underground river. The stone walls were old and tall. Link felt he was at the inner base of an enormous tower. Suddenly there was a face before him: the Happy Mask Salesman, a figure who Link remembered from Hyrule. The Agent of the Cosmos–in the guise as the Happy Mask Salesman–recognized Link, easily seeing through the transformation curse. The agent’s priority was to recover Majora’s Mask above all else. He considered Link a key ally to achieve this. He instructed the hero to recover his true form and the Ocarina of Time, and to somehow return Majora’s Mask to him. Only then could peace be restored. He added a final point: The world would end in three days. As Link gained his bearings, Majora and The Imp continued their examination of the Ocarina of Time. They could sense immense magics within the instrument, but its workings were incomprehensible. No matter, they agreed, the artifact was secure in their possession, and clearly no threat to them. They could not be stopped. There was simply not enough time. Three days remained. Suddenly, the demon and The Imp felt a paralyzing sense of déjà vu. The Ocarina that had been in their hand was gone, vanished in an instant. The two possessed a vague memory of the hero battling them atop the Termina Clock Tower. Link had taken the Ocarina and had restored his true form. But that couldn’t have happened, for no time had passed at all. The demon and The Imp suddenly had a fragmented understanding that the world had ended. As per their plan, the moon had crashed down. Impossibly, they even felt that this had happened several times. And yet, at the moments of their victories, the act had never happened. It was always back to being three days away. Their minds whirled with confusion. They remembered sensing that Link was exploring the Deku territories, the Goron territories and the distant canyons. No one could explore all three in a couple of days, and yet, they felt that Link had achieved this. The hero had even been into the darkest depths of Ikana and released the kingdom from its undead purgatory. Link had been in Termina for barely an hour. Or had it been an eternity? Contradictions and confusion danced around their shared mind. They knew that Link had battled his way across the land, overcoming the more monstrous residents in the outskirts of Termina. The hero had slaughtered the four lieutenants stationed at each shrine. They reached out with their conjoined psyche and telepathically connected with each lieutenant. They were alive, all accounted for, all at their posts. And yet, Majora knew, they had all been killed. Somehow, Link carried with him a trophy from each, a portion of their remains. The last bout of déjà vu shook them to their cores. They recalled that Link had overcome all obstacles to commune with each of the four sleeping Giants; the only beings in the world capable of stopping the impending apocalypse. Majora and The Imp tried desperately to grasp what was real. Link had regained his true form, took back the Ocarina, explored the world, conquered four shrines, destroyed their most powerful servants, and developed a plan with the great Giants. The hero had amassed a collection of potent weapons and mighty spells and was on his way to challenge them. The past and the future were repeating into infinity. No time had passed, yet ages had passed. The Imp was confused. Majora was enraged. Both believed that somehow, the Hero of Time was cheating his way through their game. Unseen beings watched the events on Termina. The Goddess of Time was enraptured, as were they rest of the pantheon of benevolent gods. They recognized that Majora had found a devious way to escape their trap. The beast intended to murder an entire planet, an act which would generate a cataclysm of suffering powerful enough to propel the entity back to the realm of the gods. The cosmos had become a gentler place without Majora’s taint, and the cosmic beings would do everything in their power to prevent the beast circumventing its exile. For a while, the task had seemed hopeless. The cosmic beings couldn’t manifest their immense power to stop Majora directly, for the demon would be able to easily harness such primal magic for its own ends. The situation was delicate. Direct intervention could have brought about the outcome they had been desperate to avoid. But to their bemusement, a mere mortal had done something quite extraordinary. The Hero of Time had used his magical Ocarina to create a time-loop around the events orchestrated by Majora. This act had prevented the cataclysm for several months, forcing the demon to relive the same three days over and over, as a prisoner of Link’s time trap. He had rescued the Gorons from their eternal winter, and helped hatch a new generations of Zoras. He had relieved the wraiths of Ikana from their undead purgatory. He had prevented alien invaders from abducting more victims, and spent considerable efforts in reuniting the cursed lovers Kafei and Anju. He had done all of this and so much more, despite knowing that the good deeds would be erased as each time loop closed on itself. Despite the futility of it all, Link had never stopped believing in helping where he could. The deities had admired Link’s bravery, compassion and fortitude. He was a mortal the likes of which they had never seen. And yet, he was only that–a mortal—and as such was not sufficient to challenge a pure demon from the dawn of time. But as The Imp had provided their ancient enemy with a vessel, perhaps Link could also be a conduit, one for their divine might. The cosmic beings were outside of the time-loop. They had valued every extra moment that Link had given them to come up with a solution. One of their own volunteered for the sacrifice. It was Fierce, the great warrior god. The entity was conflict embodied and had fought in the old times in the cosmic wars against Majora. The entity had long-desired a climactic battle with its ancient, hated enemy. It now saw its chance and would take it no matter the cost. It cared not for the petty lives of mortals. It sought only its own dark resolution. Fierce willingly surrendered the bulk of its power and allowed the pantheon to implant what remained into a mask. All that was needed was the opportunity to bestow this mask upon Link. If the Hero of Time took care of The Imp, Fierce would be there to battle the immense power of Majora. The three days had passed. The planet trembled. The moon was minutes away from its collision. The world was about to end. Link battled The Imp and Majora atop the great Clock Tower of Termina. Link fought with vigor, fully understanding the battle strategies of his adversaries and anticipating each attack. It was as if the hero had fought this battle many, many times. The demon raged that Link was somehow cheating them of their victory. The battle continued until the final minutes of the world. The villains retreated high above, out of Link’s reach, determined to oversee the final moments of Termina without distraction. The moon was crashing down, the world shook, and the sky was on fire. It was then that Link made his move. He used the Ocarina of Time to cast a spell of awakening, an enormous magical incantation that had taken a great amount of repeating time for the hero to learn. The Imp and Majora watched as the magic from the spell reached across the entire land. The two realized with horror what was happening, unable to comprehend how it was possible. In the four corners of Termina, the great Giants awoke from their centuries of rest. Their communion with Link throughout the time loop had told them exactly what they needed to do. Strong and reinvigorated, they strode across the landscape, their towering bodies coming together around the Clock Tower. There were only seconds left. The gravitational forces had started to tear the surface off the planet, with a storm of rocky debris consuming the land. The Giants raised their colossal arms, and braced themselves. It would be now or never. The moon–now an enormous orb of flaming molten matter–reached out. The Giants’ old bones creaked, their legs shook and their joints crushed their sockets. But their resolve was true. The chaos was suspended. 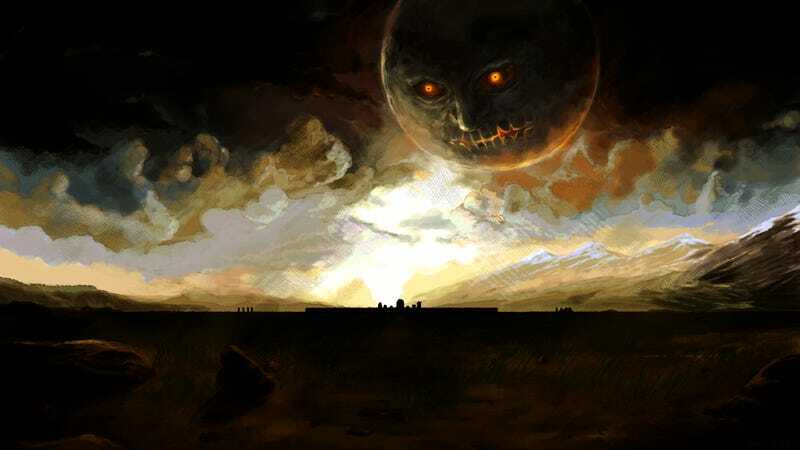 The moon was now held in a stasis above Termina, its devastation delayed. The three days had passed, and the world remained. The time loop–Link’s perfect trap for his demonic adversary–dissipated. Within the mask, Majora’s consciousness was ascendant. The demon had been freed from the time-loop, and the contradictory memories and recollections came into focus. It could now clearly see how manipulative Link had been–forcing the beast to relive the same three days over and over, ever-denying the victory. The entity raged at the defiance of the little mortal hero. Above all was Majora’s fury at its denied hunger. The maelstrom of suffering was not manifest. The beast saw itself as infallible and divine, and sought someone to blame. It turned on its host. The demon blamed The Imp for their failure and drove a mental attack into the boy’s brain, determined to kill. The Imp was once again abandoned. The sorrow within the boy was sudden and immense; an intense influx of suffering channelled straight into the mask. He collapsed to the ground, defeated and once again—alone. Majora had gathered so much suffering over the millennia: The sacrifices of the dark tribe. The tortures it had inflicted onto the peoples of Termina. It had even cannibalized its own suffering throughout the ages of its imprisonment. The well overflowed, but it needed a spark, a moment of pure misery that could inflame the collected power. The Imp had inadvertently provided just that, with the boy’s moment of perfect despair. Majora felt the reservoir of suffering ignite, connecting its trapped psyche to its vacant celestial husk above the multiverse. It wasn’t enough to return Majora to the realm of the Gods, not yet, but the influx of power was enough to grant agency. The Mask of Majora detached itself from the unconscious body of The Imp and suspended itself in the air. It had the means to carry out its great plan. It would go to the moon and extend its demonic will across the surface. It would then crash into Termina, finally creating the tsunami of suffering needed to fully restore its true nature. A gateway opened to the lunar mass. The mask entered, and Link quickly followed. Upon its arrival on the moon, Majora felt reality change. It could sense the presence of the Ancient Ones, its celestial enemies, those who so long ago had facilitated the demon’s exile. They sought to interfere. The gods of the multiverse forced the beast into a slumber, a dream powerful enough to manifest into the material. The dream took fragments from Majora’s discarded host, forcing the demon to exist as a lonely child cowering beneath a tree. The entity looked up to see four bigger children, each dancing to an unheard tune, each ignoring the terrified Majora. The slumber would not hold for long. While the beast was preoccupied, the cosmic beings guided Link to the mask that contained Fierce’s essence. The hero could not comprehend the dream he found himself in but sensed the immense power within the strange mask. The dream began to fade, and the Old Ones were forced to retreat. Their hopes for the multiverse, now rested on Link and Fierce. Link put on the mask. He shook as his senses were overloaded, the magnitude of the multiverse propelled into his awareness. He could see so much beyond the stars, the battles of bodiless conceptual entities warring for entirety of creation. He could see Majora for what it really was, an exiled deity, one that was anathema to all life. He then felt the dark will of the Fierce Deity, the coalescence of conflict. The entity had warred with Majora in the ancient times and had now descended to the realm of mortals to end their timeless enmity. The hero and the deity merged into one form. Link’s sword was also transformed, becoming a weapon the likes of which the world had never seen. It was now a demon killer. Majora had regained control of its surroundings, shattering the dream that had been imposed on it by the others. It had created a divine chamber, glowing with amassed suffering, from where it would crash the moon into the planet below. It then sensed the presence of Fierce, its most reviled enemy from the ancient times. It felt fear, hatred, but also immense anticipation. It too had long desired a final victory against its rival deity. How unexpected, the demon considered, that their final battle would take place in the realm of mortals. Fleshy growths surged out of its wooden vessel, with tendrils of flesh twisting into putrid extensions. Fierce and Link, of two minds but sharing their one body, assaulted the creature, which twisted into new, horrifying forms with each blow. The monster grew, extending its shell into a shape akin to its distant, ancient husk. It became a juggernaut, with a crown of demonic horns resting atop a fleshy body. Its limbs stretched into grotesque cartilage whips, which snaked around with a sentience of their own, seeking every opportunity to ensnare and choke. The beast moved with incredible, impossible speed. Link and Fierce withstood the onslaught. They sought gaps in the furious barrage, recognizing the moments to strike. Majora was ferocious and relentless, but they realized, the entity was not careful in its combat. It was governed by its rage and didn’t consider defensive tactics. They could direct its aggression. The two goaded the monster. It began to make more and more mistakes, affording the demon-killer the opportunity to cleave off masses of pulsating, putrid flesh. The beast grew more furious and increasingly desperate in its attacks. The battle turned. Majora was weakened, and with a mighty blow, the demon-killer tore into Majora’s manifestation. It sliced into the core of beast’s being: the mask. Fierce watched with a cruel grin as its great enemy became undone. The beast’s metamorphic flesh caught fire, as the damaged mask leaked uncontrolled magics. The beast roared in agony, as the captured suffering lost its vessel. All of its sensations were overloaded with a tsunami of distilled, stolen misery. Majora died the only way it could: burnt alive by the eons of pain it had absorbed from others. Such a day had never come before: the day a cosmic being was brought to its absolute end. With Majora’s essence destroyed, there was now no risk to the old gods. While the affairs of mortals were normally of no concern, many had developed a respect for Link, the clever and brave hero. There was a consensus to tidy the mess left behind by their demon. They guided the moon from the arms of Termina’s stoic Giants, and restored it to its rightful place and form. The mask containing Fierce’s essence was left on the moon, a deterrent to anyone trying something like this again. The trapped divine spirit within was at peace, calmed by the knowledge that it had served its purpose and defeated its nemesis. Link opened his eyes and found himself back atop the clock tower. Before him was Majora’s Mask, cracked and inert. He examined it carefully. It was just wood now, vacant of the great evil that had once been trapped within. It would never hurt anyone again. The Agent of the Cosmos–the Happy Mask Salesman–approached and thanked Link for his efforts. One of the most dangerous artifacts in the multiverse had been neutralised, and the cosmos was a safer place for it. He took the inert mask and returned it to the collection. For the briefest moment, the agent dropped the projection of being a mere salesman, feeling that the hero deserved the respect of honesty. With a smile, the strange man faded out of the universe, to continue his eternal mission to track down and contain the most dangerous artifacts in existence. The people of Termina celebrated their salvation. The Hero of Time was quiet and introspective, for his blending with the Fierce Deity had given him a moment of cosmic awareness. The Giants were reunited with The Imp. For centuries the four had endured restless dreams over their abandonment of the child, and all felt deep remorse. They may have had little choice all those years ago, but nonetheless wished they had handled the affair differently. They healed the injury that Majora had imparted into The Imp and restored him to health. The child was highly disturbed by what he had done under the influence of Majora and was overwhelmed with shame and guilt. Both parties sought the forgiveness of the other. The Imp and his family of Giants would reconcile over time. The reinvigorated titans now had all the time in the world to give to their adopted son. Centuries had passed. The day the moon fell to Termina had become a legend, one that most no longer believed. While his family slumbered, The Imp returned across the dimensions to Hyrule. The world was a mess. An invasion of Twili forces from a dark dimension had left the realm in a toxic stasis. Princess Midna, the Twilight Princess, was working on a strategy with her Hyrule counterpart to take the world back. The Imp wanted to help. He wanted to be like the legendary hero that had come to Termina such a long time ago, the champion that had freed him from the demon. He also knew his limitations. He must never again give in to the darkness. He knew that Link was a constantly reincarnated figure, appearing again and again across history to right that which had gone wrong. The Imp felt that perhaps now he was best placed to show his gratitude by assisting this latest incarnation of the great hero. The Lost Woods of Hyrule: the place of The Imp’s miserable exile hundreds of years past. The haunted paths were always tricky to navigate, and in this era of twilight and dimensional convergence, the trees were harder to pass than ever. With the whistle of an enchanted flute, The Imp conjured a group of magical puppets. He’d use them to create a path for the hero. After all, this new Link needed all the help he could get, and no one knew the route through the darkness better than the legendary Skull Kid. Thanks to the incredible artists and their enthusiastic support for the piece. If you’d like a similar read, please consider The Spectacular Story of Metroid, One of Gaming’s Richest Universes. Mama Robotnik is a video game historian living somewhere in the British Empire. He specialises in unearthing lost gaming media, but also enjoys a good long essay about his favourite games every now and then. He drinks a lot of tea, and has a horrendously naughty black and white cat called Blossom. If you would like to contact him, he can be found on Twitter.